Unfortunately, researchers have often neglected this area in favour of the more iconic kilt. From the late medieval period onwards, women in Scotland wore fashions very similar to those that were being donned by their neighbours in England, France, and elsewhere across Europe. As a general rule, however, Scots women were poorer than their English or Continental counterparts, and this would have been reflected in their fashion. Burgh-dwelling women of the sixteenth century often distinguished themselves by the long, rectangular plaids they wore as shawls. 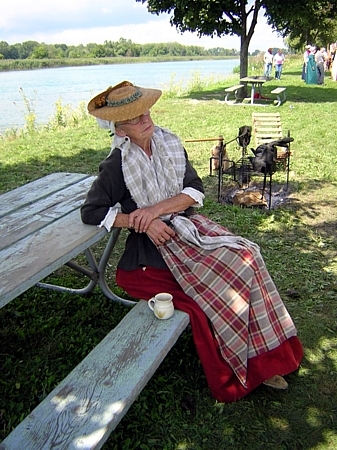 Tartan fabrics were also used for headscarves, modesty cloths, or petticoats. 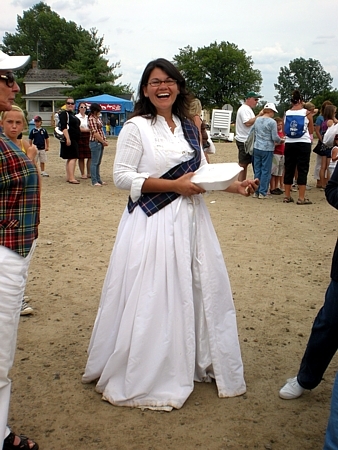 A working-class woman would wear a simple white shift that doubled as a nightgown (otherwise known as a chemise or sark) underneath a set of stays (a corset). Over these foundational garments, she would wear a solid, striped, or printed petticoat and a long-sleeved garment such as a day jacket, bed gown, casaquin, or short gown, depending on her class. 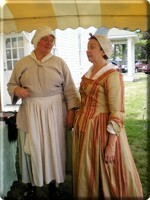 Aprons and pockets (flat cloth bags that hung from a string tied around the waist) were practical accessories. For most of the medieval period, Gaelic women of the Highlands and Western Isles dressed similarly to their Irish neighbours, their dress finally diverging in the sixteenth century. 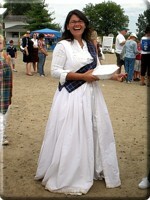 While men donned the developing kilt, women dressed in an earasaid, a length of fabric very similar to the men's plaid. It was finer and longer than the plaid, however, reaching to the ground and worn like a hooded cloak over a thick, long-sleeved petticoat. Usually white with large, bright patterns, the earasaid would be pleated just like a man's plaid, fixed around the waist with a belt and wrapped over the woman's shoulders and secured over her chest with a brooch. Usually enough material was left to form a hood that could be pulled over the head in cool or wet weather. Warm and comfortable, the earasaid was perfect for wrapping babies against their mother's body. 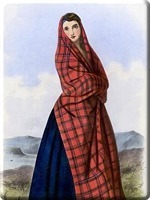 A tartan shawl called a tonnage was often worn over top of the earasaid. In the sixteenth century, Highland noblewomen began adopting the styles of their Lowland sisters, who were, in turn, dressing like English and Continental women. But whether a woman was from the Highlands or Lowlands, noble or common, she needed to wear an appropriate head covering unless she was young and unmarried. A popular type of head covering was the kertch, a square head scarf made of white linen or cotton that was frequently worn under hats or shawls. A more fashionable woman might have worn a frilled bonnet, while women in the burghs began donning straw hats in the eighteenth century. Make-up was rare for all but the upper classes in both the Highlands and Lowlands. In the eighteenth century, Highland women wore leather or wooden shoes with long stockings and garters if they could afford it. Many of them went barefoot and turned to gillies (tongueless flat lace-up shoes) when the weather cooled. It was common for many women to only wear shoes to church, putting them on at the door so they would not be damaged by the outside elements. 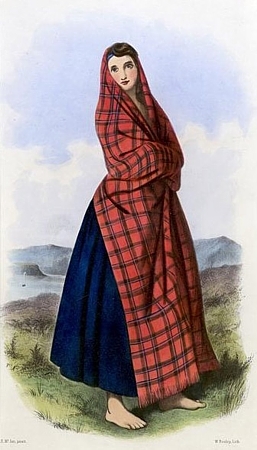 If a common Highland woman donned a piece of jewelry, it would be a plain, round brooch designed as clothing closure and attachment rather than an accessory. Bracelets, rings, and necklaces were uncommon. The brooch of a noblewoman or a burgh-dwelling Lowland woman, however, would usually be made of gold, silver or brass and were frequently passed down from mother to daughter. Luckenbooth brooches also began to appear in eighteenth century Edinburgh. A token of love given to a bride by the groom on their wedding day, Mary, Queen of Scots supposedly gave a luckenbooth to Lord Darnley as a symbol of her love and devotion. These tokens were subsequently pinned to the shawl of the couple's first baby to protect it from evil and illness. The brooch was often engraved on the back; popular inscriptions included, "My heart is thine and thine I crave," and "Wrong not the heart whose joy thou art." Poor women wore the kinds of clothes that were the easiest to make while their middle-class sisters could afford the luxury of keeping up with styles set by the upper class. 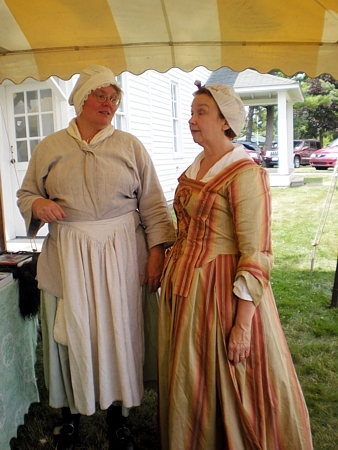 These ladies enjoyed a varied, high-quality wardrobe with an outfit appropriate for every function (riding habits, bed clothes, ball gowns, everyday wear, etc.). A woman's clothes often indicated her social standing; unless she was in her own home or yard, for example, she kept her stays and shifts covered at all times lest she be mistaken for a prostitute.